We at Interfaithfulness are change agents wherever the lives of Jews and Christians, people like you, intersect. We come together to explore the new relational possibilities made available when we consider the impact and implications of the More Jewish Jesus on religion and relationships. This of course opens up lots of issues. We are discovering that one way we can help is to host discussions, from the micro context of “two or three gathered” to the macro context of international discussions with larger groups. We launched this initiative this year on the second day of Shavuot in three one hour sessions examining the fullness of Torah, the fulness of the Spirit, and the fullness of the people of God. It was a big success! So here comes our second session and if you are prepared to learn and discuss in a non-argumentative way, you are invited! See the illustration below for details! Next to that illustration is the information you will need to link up. Please COMMENT BELOW on this posting indicating your intention to attend! 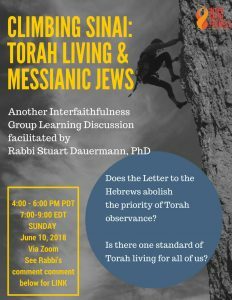 I greatly enjoyed the Shavuot sessions and am tentatively planning to attend this session, too. If possible, Rav Stuart, could you email me the written notes from those sessions? I would very much appreciate it. I will send those docs! I would like to attend, hopefully I will be back in time from a previous commitment. Will the discussion be recorded and available online for those who missed it? Great to hear of your interest! Very recent legislation coming out of Europe called GDPR (General Data Protection Regulation) has created unease and uncertainty on the Internet concerning recording people’s participation due to the financial penalties being threatened, uncertainty as to what compliance looks like, and the prospect of being shut down if deemed non-compliant. So right now, entities like ours have been advised have a wait and see attitude before stretching what now look like very narrow boundaries. You can read about this matter here: https://www.eugdpr.org/ So for now, no recordings, BUT DO COME. Is this European legislation something that arose since you previously posted your YouTube series? What significance does European legislation have to the free international internet medium? To what sort of data does the GDPR intend to address itself or attempt to protect? How could the EU possibly apply financial penalties for supposed breach of EU-citizen privacy to US citizens or anyone outside the EU? It appears to me that even personal data such as a name and email address, or credit card info pertaining to payment of fees for service rendered, cannot be proscribed if submitted voluntarily, and if the option is provided for a client to elect a “forgetability” feature that will remove their submitted data from the system as of some specified lapse period that ensures payment to have been received, along with guarantees that their personal data will not be shared with any third party even if the forgetability feature is not selected. Any legislation more draconian than that will simply eliminate commercial internet activity to or from the EU. Does it seem to you that I’m over-simplifying the matter? I think that remote participation in such a “webinar”, even with written “chat” participation, could be handled with sufficient data security and privacy protection to satisfy any reasonable regulator. Is it really any different from, say, this blog — even it if were to represent a paid service? Recording of audio in a discussion should be sufficiently anonymous not to invoke privacy issues even if the recording were to be preserved and disseminated, though registrants might be asked to authorize on their online registration form a waiver of responsibility for any audio recording in which their voice might appear. The form might also offer an option for a registrant to be known only by a pseudonym for the duration of the webinar and in any audio recordings of it that might be preserved and disseminated, after which the forgetability feature timing would control any knowledge of it or any other personal data. Am I not being sensible here? I neglected to plead for individually-recorded presentation and discussion sessions to be made available after the fact — effectively as episodes of a blog like this one — to enable post-facto commentary participation in the discussion by individuals in remote time zones such as in Israel, where the live conduct of the webinar would occur between 02:00 and 04:00 am, the wee hours of Monday morning. A similar though slightly less severe difficulty would face citizens of the EU for whom the GDPR is supposedly intended. This is great Henry! It will be good to have you with us!